Poland has signed a preliminary deal with the US on plans to host part of its new missile defence shield. Under the agreement, the US will install 10 interceptor missiles at a base on the Baltic coast in return for help strengthening Polish air defences. 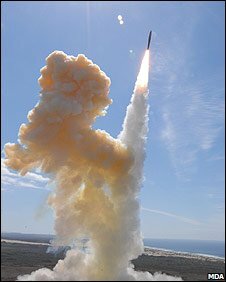 The US says the system will protect itself and Europe against long range missile attacks by "rogue states". Moscow has voiced anger at the deal, saying it worsens ties with the West already strained by the war in Georgia. At a press conference in Moscow, the deputy chief of general staff, Gen Anatoly Nogovitsyn, said US plans for a missile base in Poland "cannot go unpunished". "It's a cause for regret that at a time when we are already in a difficult situation, the American side further exacerbates the situation in relations between the United States and Russia," he said. Moscow has argued the project will upset the military balance in Europe and has warned it will be forced to redirect its missiles at Poland. However, Polish Foreign Minister Radoslaw Sikorski told the BBC's World Tonight programme that the timing of the deal had nothing to do with the hostilities. "We agreed this negotiating phase a week ago, which was... before the events in Georgia, and because of the US calendar there was some urgency," he said. "But, what is crucial, and what decided the success of the talks over the last couple of days, was that the US offered us new proposals." Unlike the US, Poland sees Russia as a bigger threat to its security than so-called rogue states such as Iran, the BBC's Adam Easton in Warsaw says. Polish Prime Minister Donald Tusk announced the agreement on national television shortly before it was signed by Deputy Foreign Minister Andrzej Kremer and US chief negotiator John Rood. Mr Tusk said Washington had agreed to meet Warsaw's main demands in exchange for hosting the 10 interceptor missiles in a former military base near Poland's Baltic Sea coast. In return, the US had agreed to help modernise the Polish armed forces and locate Patriot missiles and a garrison of US servicemen in Poland to beef up its air defences, Mr Tusk said. Poland is reported to have demanded the extra security help as part of the deal after Moscow threatened to target its missiles at any eventual bases. A White House spokeswoman said US President George W Bush "was very pleased with this development". "In no way is the president's plan for missile defense aimed at Russia. In fact, it's just not even logically possible for it to be aimed at Russia given how Russia could overwhelm it," she told AFP. The US signed an agreement with the Czech Republic in July to base tracking radars there as part of the missile defence system. The US wants the sites to be in operation by about 2012.